Mercer Islander's season game to a close on Feb. 15 and 16, with two tough contests against Metro Conference foes West Seattle (44-50 in OT), and Eastside Catholic (40-54). With an automatic bid to the State Regionals on the line, MI came up just short against West Seattle, in a hard-fought contest. MI started hot in the first quarter, taking a 15 to 8 led, behind 9 points from All-KingCo Adam Parker on three shots behind the arc. Both teams tightened up defensively in the second quarter, as MI took a slim 21 to 18 lead into the break. MI extended its lead in the third quarter, taking a 33 to 27 lead into the final stanza. In the fourth quarter, West Seattle closed with a 13 to 7 run, to knot the game at 40 and extend the match to Overtime. All-KingCo Will Lee scored all of the Islanders points in the fourth quarter. In Overtime, West Seattle took care of business at the free throw line, and closed out the game on top at 50 to 44. Lee led the Islanders with 17, followed by Parker with 12, Nigel Seda and David Pickles scored 6 each and Luke Wenzel scored 3. MI next faced Eastside Catholic in a loser-out contest, with the Crusaders coming off an upset loss against Ingraham. In another hard-fought contest, the Islanders played tough throughout, but came up just a bit short against the talented Cru squad. Junior Nigel Seda led the Islanders with 13, Will Lee added 11 and Adam Parker netted 8 for MI. Eastside Catholic then went on to a 3rd place finish in the State Tournament. The Islanders ended the season with a 17-6 record overall, and as KingCo Regular Season and Tournament Champions. MI was also rated a top 10 team throughout the year by the Seattle Times, and registered signature wins on the road against Marysville-Pilchuk -- the eventual 4th place team in the State -- and against league rivals, Bellevue, Liberty and Lake Washington. KingCo Coach of the Year Gavin Cree and his Staff will certainly use the experiences and building blocks of this successful season as fuel for the 2019-20 Season. The Islanders salute graduating seniors and Co-Captains William Lee and Teague Conder, along with seniors Rainier McDonald and James Kirkmire. All four represented Islander basketball well throughout their high school careers. It is tough to beat a good team three times in the same season, but the Islanders (11-1 KingCo, 17-4 Overall) pulled the trifecta on Wednesday night, February 6, to claim the KingCo Tournament Championship in a hard fought win over Bellevue 44 to 41. With the recent Seattle snow days and cancellation of school, neither team had hit the hardwood for practice since they faced off at Bellevue last Friday night. The championship bout started slowly, with Bellevue taking a 6 to 5 lead after the first quarter. In the second quarter, the familiar rivals settled down, as MI took a one point lead into the half at 19 to 18. Sophomore David Pickles scored 6 in the quarter for the Islanders. In the pivotal third quarter, the Islanders extended their lead to six (winning the quarter 12 to 7), as Senior Co-Captains William Lee and Teague Conder drained three's, and Adam Parker, Nigel Seda and Pickles registered buckets. In the hard-fought fourth quarter, the two rivals traded shots, with William Lee driving to the bucket for four points, and Adam Parker and Lucas Varney each hit three's, and Junior Nigel Seda scored from a mid-range jumper. Freshman Chris Clark hit the front end of a one and one with two seconds remaining for the final margin of 44 to 41 Islanders. Junior Adam Parker led MI with 10, followed by Will Lee and Nigel Seda with 9 each, and David Pickles with 8. Senior guard Jaylen Love led the Wolverines with 14 points. The Islanders will now advance to the SeaKing Tournament mash-up with the strong Metro Conference, and begin play on Tuesday, Feb. 12 at host Sammamish High against the winner of West Seattle vs. Roosevelt. Congratulations to all the Islander players, Coach Cree and the Islander coaching staff: Shea Robinson, Jeff Miller, Kevin Tempest, Justin Whitehead, Ben Seib and Bernie Morris; as well as Manager Peter Empey and Trainer Jo Leisinger on achieving the KingCo 2A/3A Regular Season and Tournament Titles for the 2018-19 season. Congratulations to Coach Gavin Cree, who in his 10th season leading the Islanders,was named KingCo 2A/3A Coach of the Year for the current 2018-19 season. Congratulations also to Senior William Lee and Junior Adam Parker -- for their selections as First Team All KingCo. Sophomore David Pickles; Honorable Mention. Congratulations to these student-athletes and Coach Cree! Mercer Island (11-1 KingCo; 16-4 Overall), traveled to Bellevue Friday night to face the Wolverines (9-3 KingCo, 14-6 Overall) with the regular season KingCo 2A/3A title in the balance. This Islanders took a 15 to 10 lead in the first quarter, led by 6 points from Senior, Co-Captain Teague Conder (2 threes), and five points from Sophomore David Pickles (1 three). In the second stanza, the familiar rivals played to a draw netting 11 points each -- and the Islanders went into the half up 26 to 21. In the third quarter, Junior Adam Parker took charge scoring 13 of his game high 22 points, including a rim rattling baseline dunk. In the fourth quarter, the Islanders continued to work on the offensive and defensive ends of the court to protect its lead against the talented Wolverine squad - resulting in a final score of 57 to 41 Islanders. Parker led MI with 22, followed by Pickles with 11. Junior Luke Wenzel added 6 along with Conder, and Senior Co-Captain William Lee added 4 with multiple assists and a strong overall floor game. Senior Hunter Hansen led Bellevue with 16 points. With the win, MI claims the regular season KingCo title with a record of 11-1. The two teams will face off again on Tuesday, February 5 at Sammamish High School -- this time with the coveted KingCo tournament championship at stake. The tourney-title game tips off at 8 pm, on Tuesday, February 5, at tournament host Sammamish High School. In a key KingCo regular season match-up, Mercer Island (10-1 KingCo, 15-4 Overall), prevailed over Lake Washington 61 to 55 on Senior NIght, January 29 at MIHS. Both teams entered the contest hot, with neither team recording a loss in January and LW looking to add MI to its impressive tally of recent league wins over Liberty and Bellevue. The Islanders started hot in the first quarter, with Junior Nigel Seda leading the way with 11 points on 4 of 4 shooting, including 3 three-pointers. In the second quarter, the experienced Kang squad went on a run to take the lead at 25 to 24 with four minutes remaining. The Islanders then closed the half on an 14-0 run to take a 38 to 25 advantage into halftime. Seda added three more buckets in the second quarter (18 for the half on 7 of 7 shooting), and Senior Co-Captains William Lee and Teague Conder added 5 each. LW came out strong in the third quarter, finding Senior Torin Montgomery consistently in the paint -- and closed the MI advantage to ten -- with MI up 49 to 39 after three quarters. William Lee netted 7 for the Islanders in the quarter, while Junior Luke Wenzel added 4. In the final quarter, LW continued to close the gap -- including from the free throw line -- where the Kangs were perfect on the evening, going 12 of 12 from the stripe. MI kept pace, however converting 12 of 14 free throws for the game. In the end, the Islanders came out on top in the hard fought contest 61-55. Seda led the Islanders with 20, followed by William Lee with 18. Adam Parker, Luke Wenzel and David Pickles added 6 each, and Teague Conder contributed 5 for MI. Torin Montgomery led the Kangs with 16. Islander Seniors William Lee, Teague Conder, James Kirkmire and Rainier McDonald may have played their last contest at MIHS, but all look forward to more games in February as they close out the regular season on Friday at rival Bellevue, and then focus on KingCo playoffs the following week. Go Islanders! Mercer Island (9-1 KingCo, 14-4 Overall) is riding a nine game KingCo win streak leading into the key final week of action. In its last three games, MI prevailed on the road at Juanita 46-25, on the road at Interlake 63-46, and at home against the Totems of Sammamish 67-33 on Friday, January 25. The Islanders next traveled to play the Saints of Interlake on January 22. The Islanders stepped on the gas in the first quarter, jumping to a 15-0 lead in route to a 23-4 first quarter advantage. Juniors Adam Parker and Nigel Seda netted six apiece in the first quarter and Senior Co-Captain William Lee efficiently led the Islander attack, and sparked MI with multiple steals. The Saints barked back, but the balanced Islander attack continued to press its advantage and finished with at 63-46 win. Nigel Seda finished with 15, Adam Parker scored 13, Junior Luke Wenzel and William Lee registered 9 each, and David Pickles and Junior Lucas Varney tallied 7 apiece. The Islanders returned home Friday, Janaury 25, and toppled the Totems of Sammamish 67-33. MI again started strong and took a 37 to 11 lead into half, highlighted by a 16 to 3 run in the second quarter. The balanced Islander attack was led by Adam Parker and Luke Wenzel with 11 each, followed by David Pickles with 10. The Islanders shared the ball well throughout the contest, with Senior Co-Captains William Lee and Teague Conder registering multiple assists each. Seniors James Kirkmire and Rainier McDonald tallied 6 points each in the victory. The Islanders control their KingCo destiny heading into the final week of league action standing alone in first place. MI, however, faces a tough challenge ahead against a hot Lake Washington squad (Home, Senior Night Tuesday, Jan. 29 at 7:15 pm) and away against reigning KingCo champion Bellevue -- Friday, Feb. 1 at 8 pm. On Friday evening, in front of a raucous Islander home crowd, MI defeated the Liberty Patriots 50 to 31, and moved into sole possession of first place in KingCo 2A/3A . The Islanders were sparked in the first half by junior Nigel Seda's trifecta of three pointers, and through their collective defensive effort. MI took a 23-14 lead into halftime, and extended the lead in the third and fourth quarters. In the second half, MI stayed connected on the defensive end, and worked the offensive glass to produce additional possessions and scoring opportunities. The deep Islander squad again posted a balanced box score, with Seda and sophomore David Pickles leading the way with 11 points each, followed by junior Adam Parker's 10, and freshman Chris Clark's 8 points. Coach Cree's Islanders are only allowing 41.1 points in league contests, and this commitment on the defensive end enabled the Islanders to dispatch two strong league rivals, Bellevue and Liberty, by near identical scores, 51-32 and 50-31, respectively. The Islanders next action is on the road at Juanita, next Friday night, January 18 at 8 pm. Go Islanders! On Tuesday evening, In a key mid-season conference match-up, Mercer Island (5-1 Kingco, 10-4 Overall) prevailed over Bellevue 51 to 32. The Islanders started quickly in the first quarter, taking a 14 to 9 lead, and then extended the lead to 33 to 13 at the half. Bellevue came out strong in the third quarter to cut the MI advantage by four, but the Islanders held firm in the fourth quarter for the win. Senior William Lee and Junior Luke Wenzel led the balanced Islander attack with 11 each. Junior Adam Parker netted 10 points and Sophomore David Pickles scored 8 for the Islanders. MI hosts Liberty on Friday evening, and will look to avenge its early season loss to the Patriots. The Islanders (KingCo 4-1, 9-4 overall) stepped out of conference on Saturday night for a 59 to 40 win over the Newport Knights. MI sprinted to an early lead and carried a 32 to 16 advantage into half-time. MI was led by William Lee with 16 points, David Pickles with 14, and Lukas Varney added 6. Senior James Kirkmire topped off the Islander scoring with a drive and finish at the buzzer. MI goes back to work (in the classroom) and in KingCo this week -- as they host league leading Bellevue (KingCo 5-0, 9-3 overall) on Tuesday night at 7:15 pm, and host Liberty (KingCo 5-1, 9-4 overall) on Friday evening at 8 pm. Come out and support the Islanders at home this week against strong KingCo competition. The Islanders (4-1 KingCo, 8-4 overall) traveled south to Palm Springs, CA and faced tough competition in the 2018 Rancho Mirage Holiday Tournament. In the first game on Wednesday, December 26, MI defeated Cimarron-Memorial from Las Vegas, Nevada by the score of 66 to 64. The Islanders were led by Adam Parker with 19, Lukas Varney and David Pickles with 12 each, and William Lee with 11. MI built a 15 point cushion at half time, and then held off a fourth quarter rally from the Spartans. Game two on Thursday took on an international flair, as MI faced off against Urspring, Germany. The physical contest featured 45 fouls, with both teams wearing out a path to the free throw line. Urspring led for three quarters but the Islanders closed hard in the fourth quarter and cut the lead to 3 for 4.6 seconds remaining. In the end, Urspring prevailed 52 to 45. Adam Parker led MI with 12 points, followed by Nate Wenzel with 9 and Nigel Seda with 6. Game three on Thursday -- where MI played Great Oak ,CA -- was another defensive battle, which found the Islanders coming from behind to take the lead at the end of the third quarter 31 to 29. The fourth quarter featured key three pointers from William Lee, Tyler Butson and Chris Clark, but the Wolfpack from Great Oak prevailed in the end 48 to 45. In the final game on Friday, MI faced Beverly Hills, CA in another tight, defensive struggle that was not resolved until overtime. Both teams started slowly in the first half, but the Islanders came out strong in the third quarter to build their first lead of the game at 27 to 25. In the third quarter, Luke Wenzel connected for 7 points and William Lee drained two shots beyond the arc. Beverly Hills tied the contest at 38 at the end of regulation, and then prevailed in overtime 46 to 38. William Lee led MI with 11, followed by Adam Parker with 10 and Luke Wenzel with 7. Congratulations to Islanders William Lee and Adam Parker who were named to the all-tournament team. While the Islanders concluded the tournament with one win against three losses, the tough competition should have MI ready for a key week of KingCo action after the break -- as the Islanders host rival Bellevue on Tuesday, January 8, and Liberty on Friday, January 11. Prior to rivalry week, the Islanders step out of conference on Saturday, January 5 and travel to Newport to face the 4A Knights. The Islanders (4-1 KingCo, and 7-1 overall) returned to road action this past week, registering two league wins against Sammamish on Tuesday night 44-30, and Lake Washington 62-50 on Friday night. In the Tuesday night contest, MI and the Totems of Sammamish both started slowly, but the Islanders took control of the contest in the second quarter and did not look back. Juniors Adam Parker and NIgel Seda led MI with 14 and 13 points, respectively. Nate Wenzel posted 7 points and William Lee and David Pickles added 5 points each for MI. In the Friday night quad game at Lake Washington, the Islanders defeated a solid, senior led Kang team. Nigel Seda showed his versatility throughout the contest, effectively driving to the hoop and connecting from distance to total 21 points. Adam Parker also recorded 14 points for the Islanders. MI also welcomed the return of senior Rainier McDonald to the lineup, as McDonald drained his first two shots and totaled 7 points on the evening. Lukas Varney and Teague Conder also added 6 points, and William Lee and David Pickles registered 4 each for the Islanders. Nick Strasburg led the Kangs with 13 points, and Torin Montgomery added 10 for LW. The Islanders next travel to Palm Springs, CA for the Rancho Mirage Tournament against strong West Coast competition. The MI Varsity (2-1 KingCo, 5-1 Overall), recorded two conference home wins this past week, 56-49 over Juanita on Tuesday night, and 57-36 over Interlake on Friday evening. On Tuesday, Coach Gavin Cree’s Islanders registered a hard-fought win against Coach Justin Mezistrano’s always prepared Rebels of Juanita. The two teams traded baskets in a scrappy first half that ended in a 21 all tie. MI extended their defensive pressure in the third quarter and found buckets attacking the rim and offensive glass to take a five point advantage into the fourth quarter. In the pivotal third quarter, Adam Parker netted 8, Nate Wentzel 4, William Lee 3 and David Pickles 2. In the fourth, both teams heated up offensively, with the Rebels draining three trifectas, only to be matched by the Islanders’ William Lee’s two shots from distance and a conventional “and-one” from Teague Conder. In the second half, the deep Islander squad created foul issues for Juanita and Adam Parker converted 5 of 6 from the line in the fourth quarter to top off his game-leading 20 point outing. William Lee totaled 14 (with 4 triples) and Nigel Seda added 7. The Rebels were led by Cameron Knowles’ 17 and Ryan Trautmann’s 13. On Friday night, the Islanders celebrated the 1999 State Championship Team, led by Hall of Fame Coach Ed Pebble, with a conference win over the Saints of Interlake 57 to 36. Both teams battled to an 8 to 8 tie after the first quarter, but MI extended the lead into halftime at 23 to 13, with David Pickles scoring six in the quarter. In the third stanza, the Islanders stepped up their defense with Lukas Varney and Nigel Seda applying pressure on the perimeter, holding the Saints to seven shot attempts and extending the lead to 36 to 22. In the fourth quarter, Luke Wenzel further sparked MI with 11 points. The balanced Islander attack (nine players scored) was led by Adam Parker with 13, followed by Luke Wenzel’s 12 and William Lee’s 11. The Islanders take to the road this week in KingCo action, facing the Totems of Sammamish on Tuesday (7:15 pm AWAY tip), and the Kangs of Lake Washington on Friday (8 pm AWAY – Quad games). For all home games, be sure to the tune in for live broadcasts on 88.9 The Bridge (KMIH). Student broadcasters Max Tanzer, William Mulflur and Nathan Buchanan, among others, provide crisp commentary of Girls and Boys Varsity home games under the leadership of Joe Bryant. The teams also thank announcer Aaron Kornblum for his continued support, along with the Islander “Animal Band”, Cheerleaders and Drill Team in creating a great home court advantage. The Islanders headed South on Tuesday to take on league rival Liberty, and pointed the bus North on I-5 on Friday, to test their mettle against the State 3A No. 10 rated Tomahawks of Marysville-Pilchuck. On Tuesday, the Islanders were defeated by Liberty, 60 to 52, as Jake Elfstrom netted 31 for the Patriots. MI jumped to an early lead in the first quarter, but could not maintain that momentum . Liberty took a one point lead into the half with a buzzer beating three pointer, and extended their lead to six after three at 44 to 38. MI fought back to tie the game at 50, but could not complete the comeback. Joe Gormley and Adam Parker led the balanced Islander attack with 12 each, William Lee added 10 and David Pickles 7. The Friday night game at Marysville-Pilchuck was an early season match up of Seattle Times top 10 teams (MI currently 9th in 3A). The Tomahawks feature University of Washington commit, 6'-4" shooting guard, RaeQuan Battle, and in this first home game created a loud and raucous environment for the Islanders. The T'hawks fed off the crowd energy early to take a five point lead after the first quarter, and then maintained a four point lead into the half at 23 to 19. Islander newcomer Nigel Seda sparked the Islanders in the first half with a mid-court steal from Battle and a high-flying finish . The Islanders grinded their way to a tie at 33 after three quarters. In the fourth quarter, the Islanders again executed down the stretch. William Lee and Teague Conder hit big threes, and Adam Parker found the hoop from the floor and free throw line. Nate Wenzel also converted clutch free throws, going ten of ten from the line for the game. In the end, the Islanders prevailed 54 to 50. The balanced Islander attack was led by Conder and Wenzel, with 10 each, followed by Parker and Lee with 9 a piece, Seda with 6, Luke Wenzel and David Pickles with 4, and Lukas Varney with 2. Battle led Marysville-Pilchuck with 21. This week the Islanders host two KingCo contests -- Tuesday with Juantia and Friday against Interlake. On Friday night, Mercer Island Basketball also celebrates its awesome alumni -- including the 1999 State Champion team. Come out and support the Islanders this week!. The 2018-19 Islanders opened the season with two weekend wins against 4A Issaquah and Eastlake. In the Friday night quad-game finale, MI prevailed 70-57 against the Issaquah Eagles. The Islanders stepped up their defense in the second half, and consistently found 6'-8" sophomore David Pickles in the low post for 11 second half points. Junior Joe Gormley displayed a deft shooting touch from beyond the arc and led all scorers with 18. With a short turnaround time, the Islanders tipped off against the Eastlake Wolves on Saturday night. In a hard-fought contest, MI prevailed 64-59 in Overtime. Eastlake took a two point lead into half-time, and stretched their advantage to eight with about 4 minutes left in regulation. The Islanders stepped up their defensive intensity to force turnovers and executed on each possession and tied the game at 54 at the buzzer on Junior Nate Wenzel 's clutch rebound and stick back. In Overtime it was all-Islanders as Senior Will Lee tallied 6 of his 13 points and Junior Adam Parker scored four of his game-high 24 points. The young, athletic Eastlake squad was led by sophomore Casey Jones 15 points (13 in the second half). The Islanders go on the road this week for their first conference game against rival Liberty on Tuesday, and clash with out of conference state-ranked Marysville-Pilchuck on Friday. The Islanders opened the 2018-19 season with two 4A challenges with Issaquah and Eastlake. Welcome to another season of exciting Islander basketball! 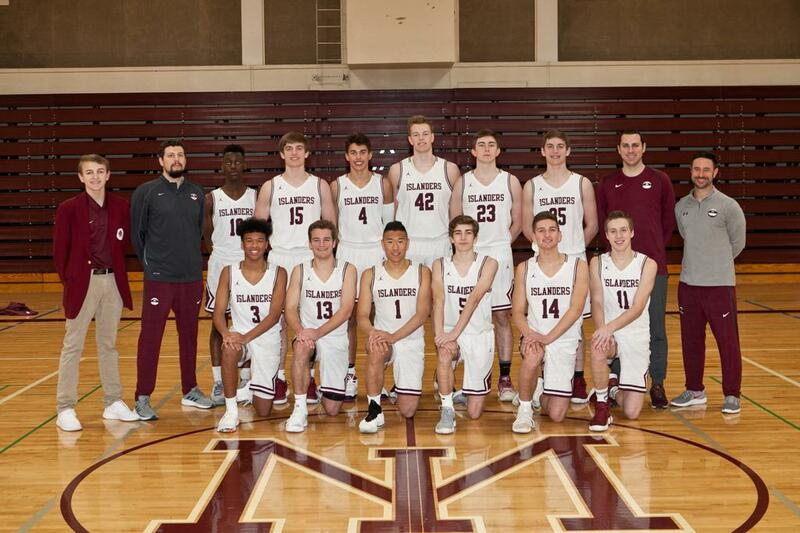 After a season where the team battled through injuries and adversity to claim a third place Kingco finish and a berth in the district tournament, the boys in maroon and white are back at it again with a more seasoned squad of competitors who will vie for the Kingco title and a berth to the state tournament once again. Along the way, the Islanders will focus on competing with each other in practice and improving each day. Our emphasis this season will be to live the Islander Way, focusing on our core values as a program and letting the results take care of themselves. Departed from 2018 are captains Griffin Emanuels and Ethan Eason along with fellow grads Giovanni Cervantes-Rocha and Reid Martinez. This group will be missed for their leadership and commitment to the program, but they have set the stage for the 2019 season, which returns 8 lettermen from last season. The team is led by captains William Lee (senior) and Teague Conder (senior). William returns for his third letter, while Teague is back for his second. Both players finished last season in the starting backcourt, which provides a steadying force this season. These two veterans are surrounded by a vast group of hungry competitors, both veterans and newcomers, who are anxious to make their mark on the Varsity floor. In the front court, the Islanders will boast a deep group of hard-working forwards who will need to anchor the team on the offensive and defensive ends. Rainer McDonald, returning for his third letter, brings experience to the group. David Pickles, a sophomore returning starter, will work alongside juniors Nate and Luke Wenzel, who got some experience last season. Forward James Kirkmire, a senior up from the JV, rounds out the group. On the perimeter, the Islanders will feature a group of four juniors in returning lettermen Joe Gormley, Adam Parker and Lukas Varney, in addition to transfer student Nigel Seda. All four athletes bring great defensive qualities to the team with their length and athleticism. On the offensive side, they each bring a unique skill set that will prove important for the squad. In addition to the experience provided by Lee and Conder, the Islander backcourt features two young newcomers who will begin the season swinging between Varsity and JV, in sophomore Tyler Butson and freshman Chris Clark. Both guards help to push our veterans in practice and are quickly gaining the trust of teammates and coaches. The strength of this Islander team lies in its experienced backcourt and the talented young players who have the opportunity to emerge as the season unfolds. The coaching staff expects to see growth and maturity throughout the season. Offensively, the ball will pop around the floor and the defense will be more aggressive due to the length, depth and overall athleticism of the team. With a tough early season non-league schedule and a challenging holiday trip to Palm Springs, the squad will be tested early, preparing themselves for the stretch run. By season’s end, this Islander squad will be poised for an opportunity to win the Kingco banner and move on to the districts and state. If Varsity at 8 pm, then JV at 5 pm; and if Varsity at 7:15 pm, then JV at 5:40 pm. Congratulations to the 2017-18 Islanders and Seniors Griffin Emanuels (Co-Captain), Ethan Eason (Co-Captain), Giovanni Rocha and Reid Martinez. The team battled all season and finished in third place in KingCo with a record of 8 wins, 6 losses, and played a challenging non-conference and playoff schedule to finish the year with an overall record of 12 wins and 12 losses. Senior, Giovanni Cervantes-Rocha, and Junior William Lee, both named 2A/3A KingCo Honorable Mention. Thanks to the generous contributions of our MI basketball community, including your membership with the MI basketball booster club, scholarships are available for the upcoming Boys Basketball Select Season. Stay tuned for tryout dates in the Fall. Islander Fans: click the link and sign up for free to follow in-game action for the Islanders. ©2019 Mercer Island Basketball / SportsEngine. All Rights Reserved.